At the end of the day, I can't tell you how much I love a good bath. 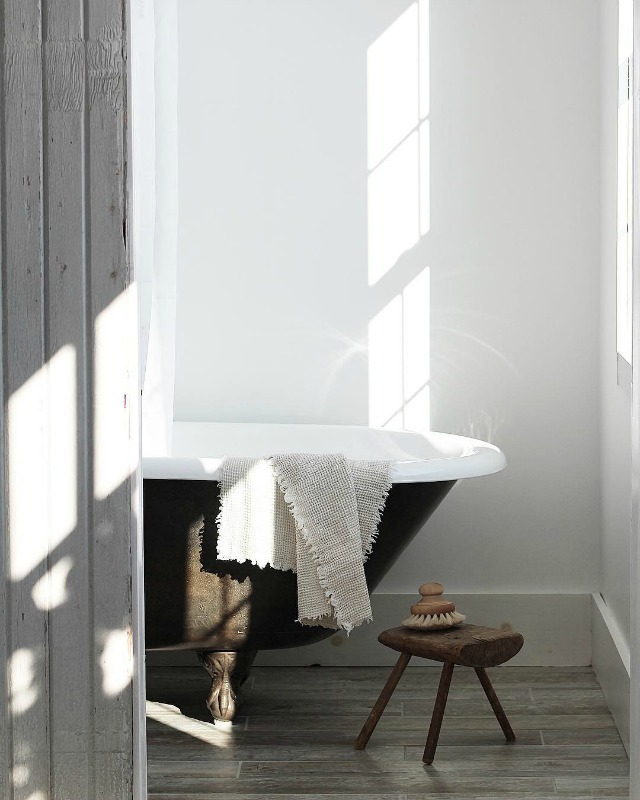 Turning the lights off, lighting a candle or two, and soaking in a warm bath is just good for the soul. I've always been a bath girl and after trying numerous products - soaks, scrubs, oils, you name it - I've finally found my favorite products in each one of those categories that I can't live without. For starters, I just ordered and starting using these 100% linen towels (in all sizes, in flax) and they're so useful + beautiful. Perfect for adding to your decor, too! BATH OIL - this Jo Malone scent is my absolute favorite. It's so warm and the scent fills the entire room. (I also have the handsoap in our bathroom and it's my all time favorite.) I love using an oil, at least a couple of times a week, because my skin is so dry. This one not only smells amazing, but hydrates your skin without feeling too oily when you get out. They also make this smaller size, in case you just want to give it a try without fully committing, and I can typically get 10+ baths out of the small size. BATH SOAK - I love this Coconut Bath Soak by Herbivore. It only takes a small amount, but gives your bath water a milky feel/texture that is so soothing to your skin. Similar to epson salt, it also has anti-inflammatory properties, but is all natural. It's completely organic - cruelty free, vegan, and no artificial ingredients. Plus, the minimalistic packaging of this brand speaks to me! BUBBLE BATH - My favorite, OG bubble bath that I'll never stray from! I started using this bubble bath about 4-5 years ago and I'm obsessed with it. L'Occitane is a french brand that is so good it makes you feel like you're taking a bath in the middle of Provence. The lavender scent is so calming and clean, but not too overwhelming. It only takes a quarter size drop for endless bubbles that fill your bath tub! BATH SCRUB - I've tried (and still use) so many of the products by OUAI and haven't been disappointed yet. This scrub smells SO good and isn't too harsh on your skin. I simply spoon-out a small amount on a washcloth and exfoliate my chest, arms, and legs with it. (It's also considered a 'scalp scrub' alhtough I've never used it on my head.) My favorite thing about it is it turns into an oil afterwards and leaves your skin feeling silky and amazing. Totally a win-win! BATH CANDLE - not technically a bath product, but as I'm sure you all know by now, my favorite candle of all time. The scent is just so good and it only has to burn for a few minutes to fill the entire room. They're a bit on the pricer side, but as long as you're aware of how long you're burning it, they really do last a long time. Worth every penny, in my opinion! We all have those in-and-out baths when we're in a rush, but on those cold, winter nights when lighting a candle and soaking for an hour or so is just what the doctor ordered - you'll love having any of these products to choose from!